Sorry to everyone who has been waiting! Without further ado, here's my take. - IPO closes on 17 July 2017, 12 noon. Even though you've probably never heard of NetLink, the business isn't new. Back in 2008, OpenNet won a tender to design and maintain passive infrastructure in Singapore in order to build a high-speed broadband network in Singapore. 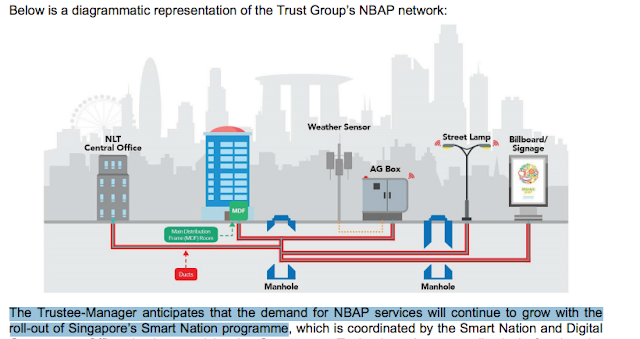 SingTel was supposed to transfer its manholes, ducts and exchange buildings to OpenNet, and so in 2011, SingTel established NetLink Trust to which it transferred its infrastructure assets to. NetLink then acquired OpenNet in 2013, with IDA mandating that SingTel needed to divest the majority of its ownership in NetLink by 2018. Which leads us to this week's IPO. 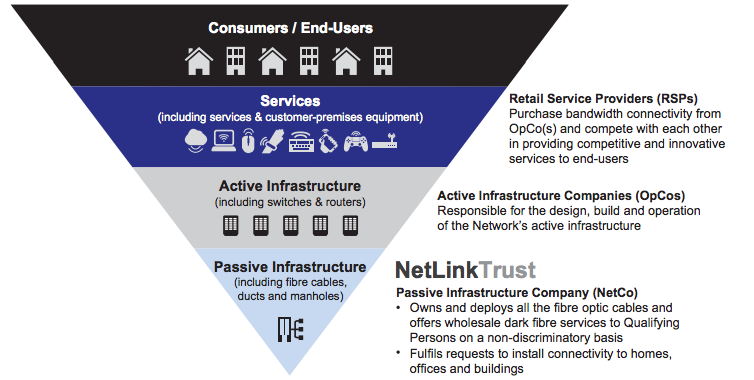 In a nutshell, NetLink designs, builds, owns and operates the passive fibre network infrastructure of Singapore’s Next Gen Nationwide Broadband Network. This currently consists of ten Central Offices and approximately 76,000 km of fibre cable, 16,200 km of ducts, and 62,000 manholes. The Trust Group’s primary customers are Requesting Licensees - SingTel, Starhub, M1, MyRepublic and Nucleus Connect. Competition or churn among Retail Service Providers does not adversely affect the number of connections that the Trust Group provides, as all Retail Service Providers utilise the Trust Group’s network (although not exclusively) in delivery of their active fibre services. 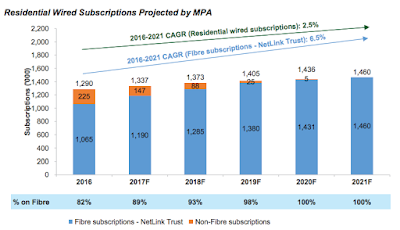 To the extent that competition between Retail Service Providers reduces prices, such competition may lead to a higher number of fibre connections requested by end-users, so NetLink will still be the beneficiary regardless. There are a few tailwinds driving NetLink's business in the near future - the growth in data consumption and demand for faster Internet speeds, as well as Singapore's Smart Nation initiative. I'll elaborate more on these across the 3 segments later. It is a monopolistic and resilient business model. Ultra high-speed fibre broadband has become a necessity and having tasted faster Internet speeds, who would want to go back to the age of the dinosaur? I quite like how the business is pretty much a monopoly (in the area of residential fibre connections). Its economic moat is quite strong as it will take a lot of resources for any other competitor to enter the market and set up its own infrastructure (not to mention near impossible, given the regulatory regime). For those of you who prefer investing in defensive stocks like telcos (SingTel, Starhub, M1) and rubbish-clearing services (800 Super, Colex), this will be another one you might want to add. It has recurring revenues that are almost guaranteed. NetLink is highly cash generative, with an estimated $140 million for 2018 and $217 million for 2019. It is not hard to see why, as its revenue comes from a one-off installation charge for each termination point (upon the initial connection) and thereafter, a recurring monthly connection charge. 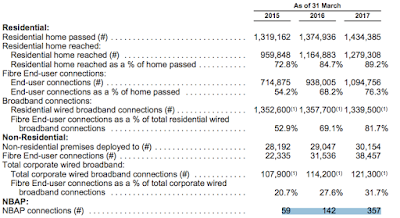 The business is also resilient through economic cycles (would you use less / slower Internet in a recession? Nahhh...you'll probably be watching more dramas in your free time instead!) With online video and audio services such as YouTube, Netflix and Spotify becoming a key lifestyle feature, user demand for data and faster speeds will only continue to grow. Residential - NetLink is currently the market leader and while there is definitely growth in this segment (especially with new houses being built), there is a cap as there are only so many households in Singapore. Corporate - The Trust currently supports one-third of the corporate market. 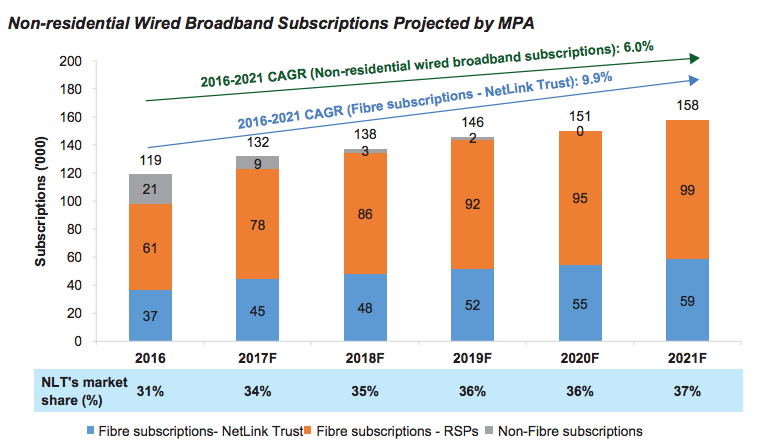 While government grants to improve productivity through digitalisation and subsidies for enterprises should drive further growth, I am less optimistic on NetLink's growth in this aspect as it competes with other RSPs (SingTel, Starhub and M1) which owns its own fibre network infrastructure in key business districts (eg. the CBD and Changi Business Park). Some of these providers also provide connectivity for data centres. NBAP - Here's where I see unlimited growth potential which has largely been untapped on thus far. There are a lot more connections that can be made on our streets where NetLink stands to benefit from. I'm optimistic on this as a major growth area because just look at how the growth in NBAP far surpasses that in residential and corporate connections! It has highly scalable operations with low incremental costs. Once the basic infrastructure has been built, the hardest part is over and you can continue to support a growing number of connections without much incremental capital outlay other than maintaining the network. 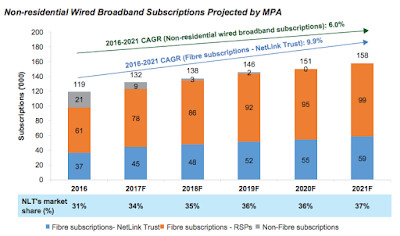 Furthermore, its operating costs will be kept relatively low as NetLink does not need to spend too much on marketing itself - it will mostly be the RSPs marketing their services to reach the end-consumers. Experienced management team with proven track record. I'll quote from the prospectus on this one: "The Trustee-Manager is led by a strong executive management team, comprising the Chief Executive Officer, Mr. Tong Yew Heng, the Chief Financial Officer, Mr. Wong Hein Jee, and the Chief Operating Officer, Mr. Chye Hoon Pin, who together have more than 80 years of experience in investment management, infrastructure, and/or telecommunications sectors." At the moment, its total debt /EBITDA ratio is still at a healthy 2.3x. However, there will be high capital outlay until 2019 as the Trust expands its network infrastructure and management intends to fund this through bank loans. In today's environment of rising interest rates, this will be a growing liability to take note of, and we should see its gearing increase accordingly in the next 2 years. The managers have also said that they expect the earnings (per unit) to drop from its current 2.06 cents to 1.14 cents next year, which means we're looking at a potential 45% drop in net income next year, and this may or may not result in a knee-jerk reaction in its stock price, giving us another opportunity to buy in. The growth story promised by the Trust may very well sound appealing, with fantastic revenue increases of $258 million to $300 million in the last 2 years to boot. 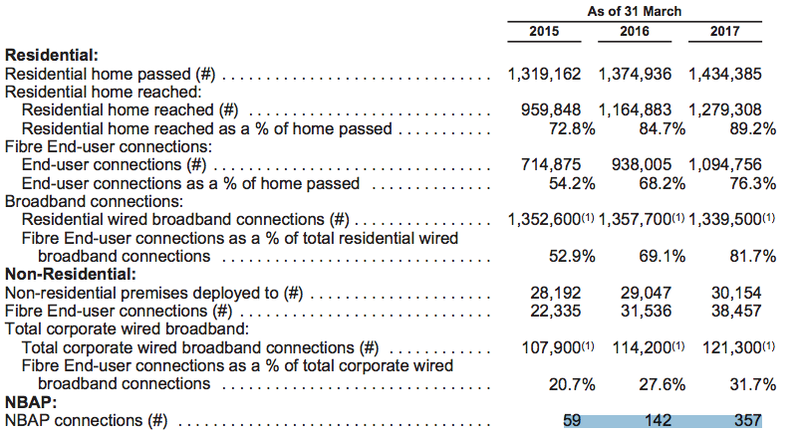 However, note that there is a cap on its growth in residential connections especially once it hits 100%, which shouldn't be that far off in the near future. I'm less hopeful about its growth in the non-residential market for reasons detailed above. NBAP is promising but it remains to be seen how significant it will be in its revenue model. There is insufficient data at this point in time to gauge conclusively. IMDA is currently investigating the fibre service interruption incident which affected the Tanjong Rhu area on 13 December 2016. In addition, NLT’s fibre cables were damaged by a third party on 11 April 2017. The cable cut incident occurred along Boon Lay Avenue and damaged a total of eight fibre cables. As the cable cut affected more than 500 end-user connections, and full service restoration took longer than the 12-hour safe harbour, we might potentially be looking at a fine similar to the $500,000 imposed on OpenNet in 2014. If further interruptions were to occur, especially on a more major scale, I do not rule out the possibility that the Trust's cashflows will be impacted by potential fines in the future. This is a business trust, so don't mistake it for a REIT where 90% of its taxable income is mandatory to be paid out to unit-holders. At 81 cents, is the stock overvalued? P/E: 39x (using 2017's EPU of 2.06 cents) is extremely high. To be fair, you're basically paying a premium for its monopolistic and resilient business model with guaranteed resilient cash flows. P/B: approximately 0.9x but I'll take this with a pinch of salt because it is quite unlikely that the Trust will be able to sell off its assets without regulatory intervention. Has the growth story been fully factored into its current price? 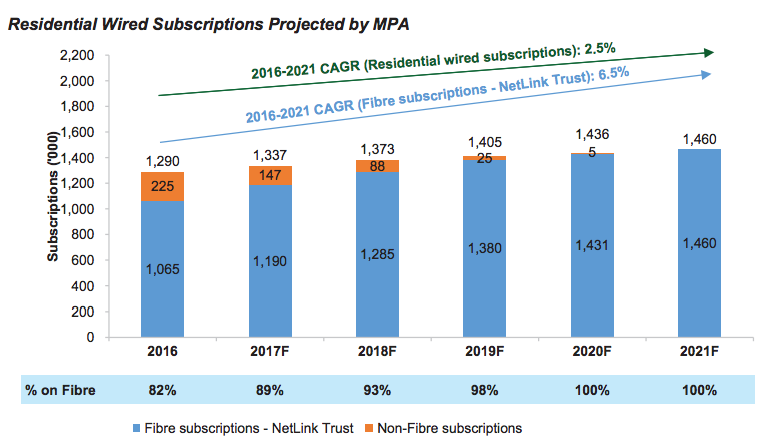 NetLink's growth is primarily limited to Singapore, and I'm more inclined to believe that the growth has already been factored in given its premium valuations. Unless NetLink finds another way to innovate and utilise its infrastructure to generate revenue through other newer means, there is a limited runway for this business to grow. SingTel? After all, they're looking at a potential $2 billion windfall from divesting 75% of their ownership in NetLink through this IPO. NetLink has a highly appealing business model which is resilient through economic cycles and poised to ride on Singapore's Smart Nation initiative in the coming years. With a yield of 5+%, this is a good stock to hold for the long term for stable income payouts (as long as they don't cut or withhold dividends completely). Given the hype surrounding this IPO, I'm more inclined to take a contrarian approach since many people (even novice investors) have told me they'll be buying. In the words of Warren Buffett, be greedy when others are fearful and fearful when others are greedy. When I started on this analysis a week ago, it was stated that the IPO price would range from 80 to 91 cents per unit during the book-building phase. Since the price has been finalized at the lower end, it signals that there was probably lacklustre demand during this phase and thus I do not expect the price to rally too much on the first day of listing. In fact, I won't be surprised if the price remains stable around IPO price for a long time. If it continues to be hyped up in the coming week, I won't be surprised if the price increases slightly upon listing, only to drop again later on. I will sit on the sidelines for now and wait for a better chance to buy in. Thanks for sharing your views. It is useful in my decision process and much appreciated. I give you one like. Thanks for sharing. Really selfless. May your wealth increase in folds. A good writeup. Thanks for sharing esp the part on the 'Key Considerations'. HI newbie here. May I ask is your P/B ratio calculated based on the consolidated bs or unadudited pro forma bs? I used the consolidated balance sheet but it wouldn't be wrong to use the unaudited pro forma balance sheet either, you just gotta make and adjust your assumptions accordingly then and check if it is reasonable.